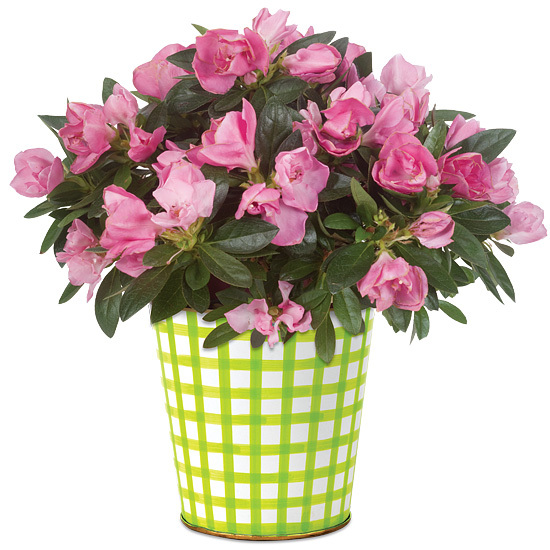 This unique variety of azalea plant is called “Remembrance” and is noted for its bright pink flowers, each little bloom resembling a tiny rose perched atop a tree of green foliage. 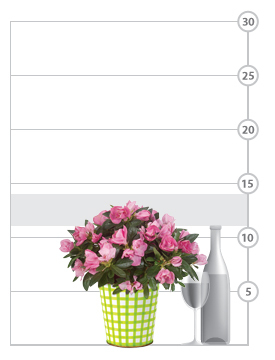 The multi-blossomed plant clearly makes a special gift and looks stylish in any setting. We’ve set the 6″ grower’s pot in a hand-painted cachepot with a chartreuse gingham pattern and hue that flatters both blooms and foliage. Miniature roses can be grown indoors successfully but do require special care. Place your plant on a windowsill or in a sunny, humid area. You will know your rose isn't getting enough light if its stems seem to stretch out leaving wide spaces between the leaves. Your plant will bloom indoors for up to two weeks afterwards we recommend planting it outside in a sunny area. Please note: Miniature roses have little to no fragrance.